THE STORY - An anthology of six short films that take place in 19th-century post-Civil War era during the settling of the Old West. THE GOOD - The Coen Brothers' humor and insight into morality and mortality weaves itself through six distinct stories told with a passion for storytelling. THE BAD - Due to the restricted nature of each story, we cannot help but want more from the characters and the stories. Some stories work better than others. ​​The Coen Brothers have made Western films before but not like "The Ballad Of Buster Scruggs." Where "No Country For Old Men" was a neo-western set in the modern age and "True Grit" was a remake of an old-fashioned western film, their latest film (and their first working with Netflix) is a mystical anthology of six separate stories that showcases the myth and harsh reality that was the Old West. With absurd humor, surrealism, colorful characters and plenty of violent moments, the Coen Brothers manage to say pretty much everything they'll ever need to say about the Western genre with "The Ballad Of Buster Scruggs." Told via a live storybook, "The Ballad Of Buster Scruggs" tells six distinct short stories, all set in the Old West. 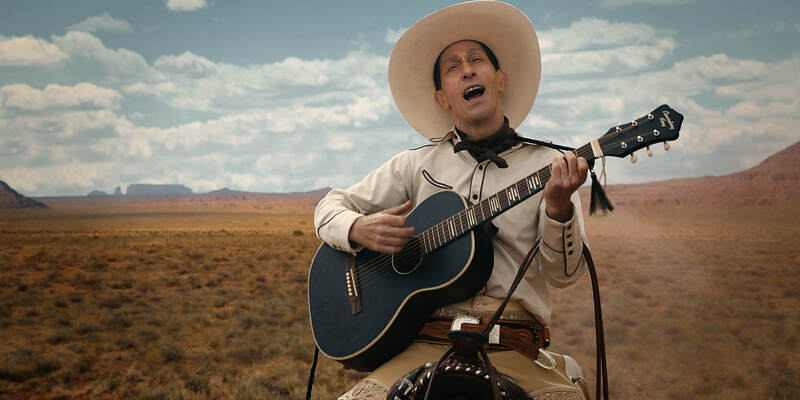 The first follows a slick shooting, all white dressed cowboy named Buster Scruggs played with charm, humor and eye-winking delight by Tim Blake Nelson. Even though it has been many years since his last collaboration with the Coens in "O Brother, Where Art Thou?," those hoping to hear the character act sing again will be happy to hear that there are a few surprising musical numbers in this hilarious, fourth wall breaking hoot of a first story. Despite his small stature and good manners, Buster Scruggs is a dangerous shot nobody should mess with. But mess with they do, and bullets are what they get. However, as Buster says at one point, "You can't be top dog forever." And it is here that the throughline establishes itself for "The Ballad Of Buster Scruggs" - the Old West was a dangerous time to be alive and death could find you at any moment. We then move over to the next story titled "Near Algodones," which follows a cowboy bank robber (James Franco) who unluckily tries to rob an unassuming, rambling, eccentric bank teller (Stephen Root). The bank robber faces a series of near-death situations that he somehow keeps on managing to survive, either through pure luck or perhaps some divine cause. This may be the least engaging of all of the stories (and possibly the shortest), despite its continuation of violence and humor from the first story and a very amusing visual bit involving Franco's horse. "The Ballad Of Buster Scruggs" then starts to switch gears with the quiet and somber story titled "Meal Ticket" with Liam Neeson as a poor traveling carny who's "meal ticket" is an actor with no arms and legs (Played by Harry Melling), who he hauls from town to town to perform various great works of writing for the common folk. Whether it's in the cold, rain or snow, the actor performs the same lines night in and night out with passion. As the crowds and income on the show begins to dwindle, the carny starts to contemplate his relationship with the actor. We then move to the halfway point of the Coen Brothers' latest and my favorite story of the film (I'm sure everyone will have a different favorite for different reasons), "All Gold Canyon." This one follows a prospector played by Tom Waits. Here, cinematographer Bruno Delbonel's work (which has been gorgeous throughout already) takes a dramatic turn as we are introduced to a wide open, vast, lush, green hilled valley. This one-man show finds the prospector searching for gold at the end of his life, as we watch him dig holes in the earth, scavage through the nearby water and come so close to obtaining his goal. Featuring a twist at the end and one of the best line readings of the year after a dramatic moment, "All Gold Canyon" is a wonderful acting showcase for Waits who talks to himself throughout the story. We then move to what I believe is the longest story titled "The Gal Who Got Rattled" featuring Zoe Kazan as Alice Longabaugh, a warm, caring woman who is to be married off to her brother's business associate once they reach the end of their journey in Oregon. Think of this segment like the old game "The Oregon Trail" where disease, raids, and other dangers could strike at any time. Along the journey, she falls for one-half of the traveling group's guides named Billy Knapp (Bill Heck), a polite gunslinger who is searching for a better life where his partner, the older Mr. Arthur (Grainger Hines) is not looking to move on and instead relishes in the violence and difficulties of their job. This love story starts off awkwardly but becomes delicate, beautiful and in the end heartbreaking. It also features a dog character named President Pierce, who is charming and absolutely wonderful. And then, we finally come to the end of the Coen Brother's exploration of the West with the final story titled "The Mortal Remains." This is by far the most dialogue-heavy of the six stories and features five people traveling together in a carriage: a Frenchman (Saul Rubinek), a lady aristocrat (Tyne Daly), a fur trapper (Chelcie Ross), and two bounty hunters played by Jonjo O’Neill and Brendan Gleeson. Together, they discuss the value of a human being's life, love, and other various topics until they reach the end of their journey. Once there, the story takes on almost a supernatural quality though as if the characters are staring death straight in the face, unaware, as are we, as to what their ultimate end will be. The Coens weave their message of mortality and morality through to the end as the characters meet their unknown fates, tying "The Ballad Of Buster Scruggs" full circle. For so many fascinating stories, "The Ballad Of Buster Scruggs" cannot help but still feel incomplete or at the very least unfulfilling. While the stories told all do what they set out to do, one still wishes we could get more time with these characters, more characterization or at least have a chance to see some of the characters interact with each other. Maybe, if this feature-length movie had been made into a television series (as many thought it would be at first through Netflix) then we could've received even more of the Coen's greatness. As is, it's possible that "The Ballad Of Buster Scruggs" will close the storybook on the brother's thoughts on the West. It's hard to imagine what else the famous filmmaking duo has left to say on the genre. With careful storytelling, gorgeous cinematography, a score from Carter Burwell that does the Western justice and a ton of performances ranging in all shapes and sizes, it's hard not to find something to love in the Coen's buffet feast of a film.